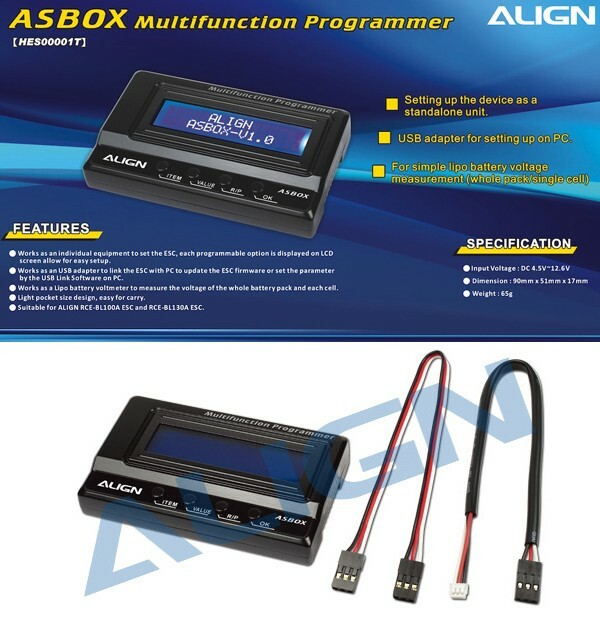 • Works as an individual equipment to set the ESC, each programmable option is displayed on LCD screen allow for easy setup. • Works as an USB adapter to link the ESC with PC to update the ESC firmware or set the parameter by the USB Link Software on PC. • Works as a Lipo battery voltmeter to measure the voltage of the whole battery pack and each cell. • Light pocket size design, easy for carry. • Suitable for ALIGN RCE-BL100A ESC and RCE-BL130A ESC.